I’ve always been fascinated by famous historic and cultural sites from around the world. When I was a child, flipping through encyclopedias while researching for school projects, the thought of exploring these sites was a distant dream. With the new Google World Wonders Project, that dream is now a little closer for students and others around the globe. 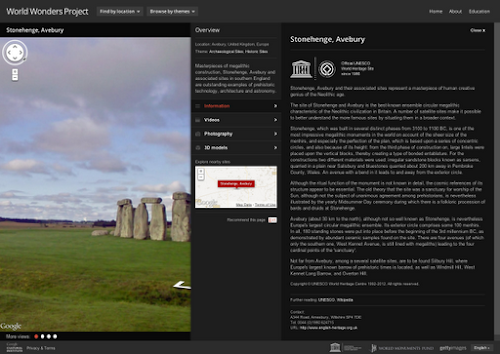 World Wonders uses Street View technology to take you on a virtual trip to each iconic site. Most could not be filmed by car, so we used camera-carrying trikes to pedal our way close enough. The site also includes 3D models and YouTube videos of the historical places, so you can dig in and get more information and a broader view of each site. We also partnered with several prestigious organizations, including UNESCO, the World Monuments Fund, Getty Images and Ourplace, who provided official information and photographs for many of the sites. We hope World Wonders will prove to be a valuable educational resource for students and scholars. A selection of educational packages are available to download for classroom use; you can also share the site content with friends. World Wonders is part of our commitment to preserving culture online and making it accessible to everyone. Under the auspices of the Google Cultural Institute, we’re publishing high resolution images of the Dead Sea Scrolls, digitizing the archives of famous figures such as Nelson Mandela and presenting thousands of artworks through the Art Project. Find out more about the project on the World Wonders YouTube channel, and start exploring at www.google.com/worldwonders. This entry was posted on Thursday, May 31, 2012 at 4:00 AM and is filed under maps and earth. You can follow any responses to this entry through the RSS 2.0. You can leave a response.